Paradise Air Inc is proud to serve the Frisco community! About Frisco, TX - Happy to be your hometown Heating & Air Conditioning Contractor! Located in portions of Collin and Denton County, Texas, Frisco is a Dallas suburb that is expanding quickly. The population as of 2014 was nearly 138,000, and from 2000-2009 this city was the fastest-growing in the U.S. Known as “Tree City USA,” Frisco has been named one of the best places to live in the U.S. by CNN, and Forbes has also ranked it as one of the best places to move in the country. These distinctions could be due to the numerous job opportunities located in this city, and top employers include the local school district, T-Mobile USA, and Mario Sinacola & Sons Excavating. Frisco is part of a humid subtropical climate region known for hot summers and mild winters. The city sees about 39 inches of rain each year and 230 sunny days. As a major metropolitan area, Frisco is home to a variety of attractions. The most notable are the Dr Pepper Arena and the Dr Pepper Ballpark, and other sporting venues include the Frisco Soccer Complex. Golf fans may like to check out the course at Stonebriar Country Club or Westin Stonebriar Resort Golf Course, while wine connoisseurs may like to visit CrossRoads Winery. 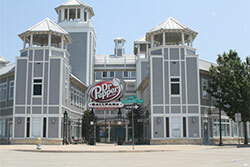 Other popular area attractions include Pole Position Raceway and the Frisco Heritage Museum.